Healing, nor transformation, ends with our own. Rooster’s crow was more than a morning alarm. It was a wakeup call to drink in life’s colors and generously pour them out, again. For months, I listened to a rooster from a nearby farm. At first, I cackled imagining him strutting his stuff around a pen full of hens. Later, my private comedy led me deeper. There is a legend about Crow, like Rooster, once having rainbow-colored feathers. Back then, Crow sang beautiful tunes. To save fellow creatures from winter’s chill, Crow, risked his life by carrying a blazing stick from the sun, back to earth. The fire from this one self-sacrificing act charred Crow’s feathers and affected his voice forever. Why do we strut or voice particular tones? 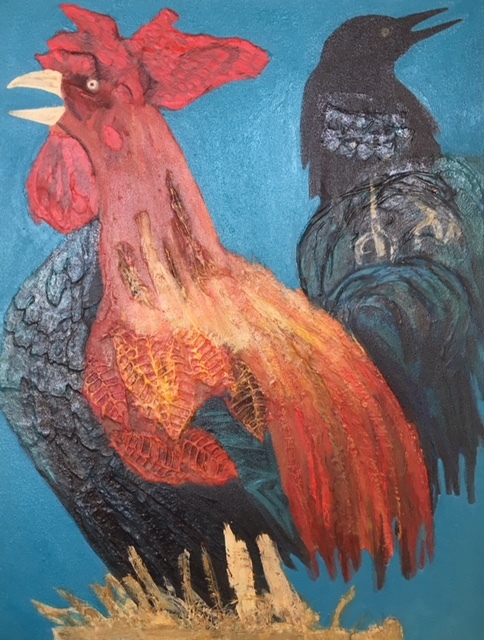 Rooster encourages us to be seen and heard, while Crow asks us to balance our outer lives with trust and often, sacrifice. Both Gandhi and Mandela voiced truth, from love, in cultures of abusive polarity. Each time I look at either of their lives, I am gripped by the power of their arduous transformation. Both men left their mentoring spirits that remind us to speak, and also befriend, sit face to face, dine or worship with someone who feels as fervently, as we, toward another view. When we dare, we find other commonalities. If we trust that we live on, we stand from a weightier intention. We speak and act, knowing that we will leave our lingering spirits behind, offering people and places either life or death. We can choose to value life and accept that suffering is inevitable, or cave to this sweeping dehumanization of any person or group that opposes our persuasions. Infinite Love asks us to swallow the clashing colors, transform them and cough up workable palettes. Crow points us to a sacred way, broader than a particular belief system or political agenda and deeper than measurements or morals. In living from a sense of respectful generosity, we begin seeing through both colorful invitations to ugly intentions and dark facades to welcoming colors. If we deny Love, Rooster’s crow will fade from its exuberant invitation. Instead, Crow’s harsh caw; will remind us of what could have been. Is my intention love, or am I just another clanging cymbal?